This new high-resolution map shows the magnetic field lines embedded in gas and dust around the supermassive black hole (Sagittarius A*) residing in the core of the Milky Way. Red areas show regions where warm dust particles and stars are emitting lots of infrared radiation (heat), while dark blue areas show cooler regions that lack pronounced warm and dusty filaments. E. Lopez-Rodriguez/NASA Ames/University of Texas at San Antonio. At the center of nearly every galaxy resides a gargantuan black hole. For the Milky Way, the supermassive black hole — dubbed Sagittarius A* — is so massive that its gravity flings stars around at speeds of up to 18.5 million miles (30 million kilometers) per hour. In order to accelerate stars to these breakneck speeds, astronomers estimate that Sagittarius A* must be about 4 million times more massive than the Sun. With such a monstrous and intriguing object located in the center of our galaxy, you would think that astronomers know a great deal about it. However, thanks to the fact that the Milky Way is full of light-blocking gas and dust, many questions still remain about the structure and behavior of Sagittarius A*. In a paper published last month in the Monthly Notices of the Royal Astronomical Society, astronomers shed a bit of light on this black hole by producing a new high-resolution map that traces the magnetic field lines present within gas and dust swirling around Sagittarius A*. The team created the map, which is the first of its kind, by observing polarized infrared light that is emitted by warm, magnetically aligned dust grains. Because infrared light passes straight through the visual-light-blocking dust located between Earth and the Milky Way’s core, astronomers were able to view the area around Sagittarius A* much more clearly than would have been possible with other types of telescopes. 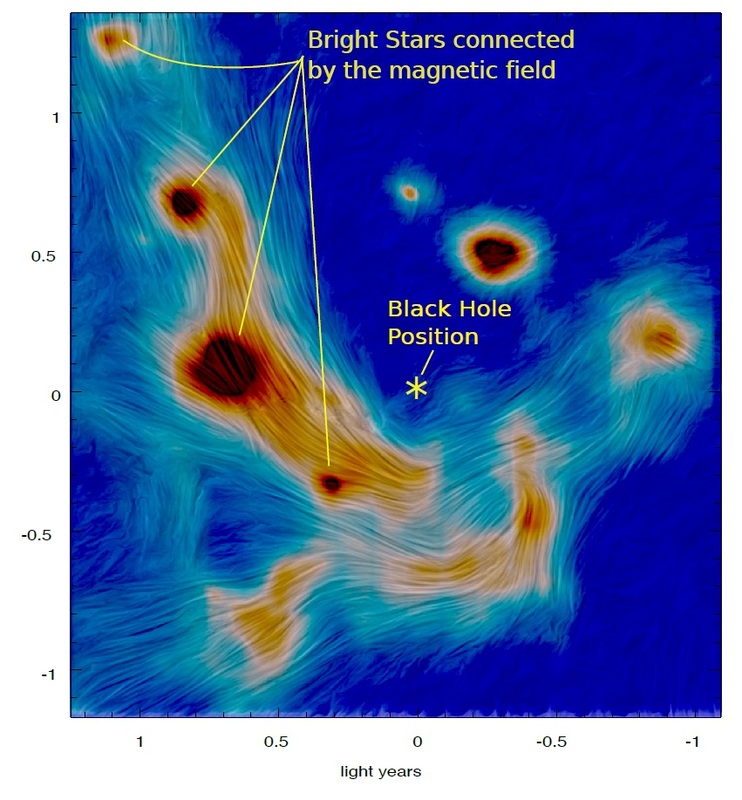 Furthermore, since CanariCam combines infrared imaging with a device that preferentially filters polarized light associated with magnetic fields, the team was able to trace the magnetic field lines around Sagittarius A* in unprecedented detail. To create the detailed map, which spans about one light-year on each side of Sagittarius A*, the researchers used the CanariCam infrared camera on the Gran Telescopio Canarias (GTC), located on the island of La Palma, Spain. Because infrared light passes straight through the visual-light-blocking dust located between Earth and the Milky Way’s core, astronomers were able to view the area around Sagittarius A* much more clearly than would have been possible with other types of telescopes. Furthermore, since CanariCam combines infrared imaging with a device that preferentially filters polarized light associated with magnetic fields, the team was able to trace the magnetic field lines around Sagittarius A* in unprecedented detail. These new observations not only make for a wonderful image — the clearest infrared image of our galactic core to date — but also provide astronomers with vital information regarding the relationship between luminous stars and the filaments of gas and dust that stretch between them. One prominent feature in the map shows that dusty filaments connect some of the brightest stars in the center of the Milky Way despite incredibly strong stellar winds. The researchers believe that these filaments remain in place because they are bound by magnetic fields that permeate through the dust. Based on map, the team also thinks that a smaller magnetic field exists near the core of the Milky Way, and that the field gets stretched out as intervening filaments are pulled apart by gravity. The researchers point out that the filaments, which are several light-years long, seem to pool below (on the map) Sagittarius A*. The team believes that this likely marks a location where streams of gas and dust orbiting the black hole converge. Using the CanariCam on GTC, the researchers plan to continue probing the magnetic fields traced in dusty regions throughout our galaxy. Additionally, they hope to continue gathering more detailed observations of the core of the Milky Way to further study the magnetic field around Sagittarius A*. In particular, they would like to determine how the magnetic field interacts with clouds of dust and gas that orbit farther from the black hole, at distances of several light years. But for now, we’ll just have to be satisfied with the latest piece of the puzzle. [The work of Andrea Ghez deserves credit here. Her current research involves using high spatial resolution imaging techniques, such as the adaptive optics system at the Keck telescopes, to study star-forming regions and the supermassive black hole at the center of the Milky Way known as Sagittarius A*. She uses the kinematics of stars near the center of the Milky Way as a probe to investigate this region. 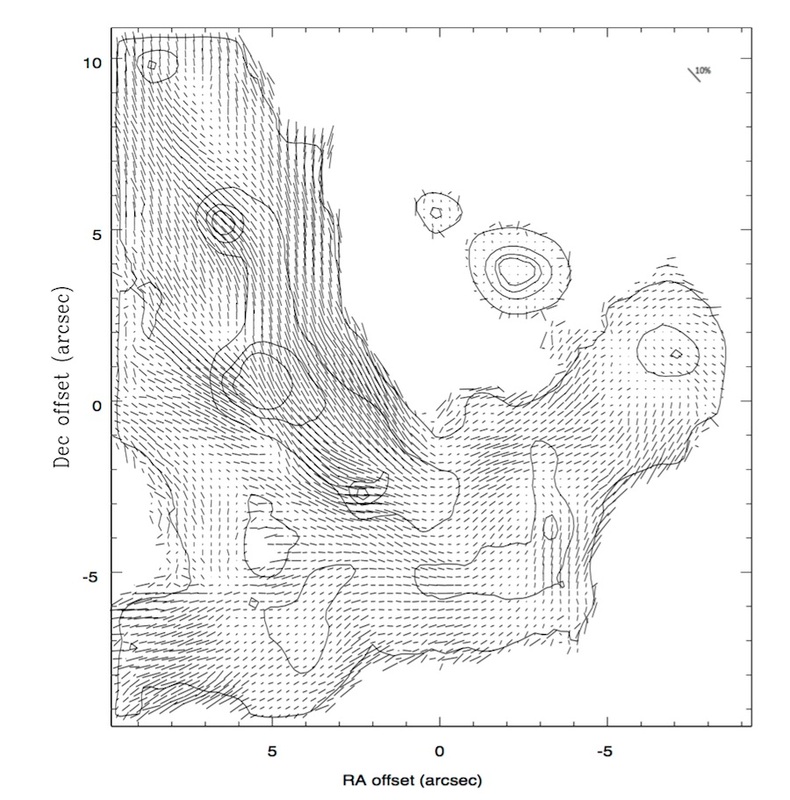 The high resolution of the Keck telescopes gave a significant improvement over the first major study of galactic center kinematics by Reinhard Genzel’s group.